1968 was the year that horror cinema sought to change the way in which it scored its films and began to develop alternatives to the increasingly cliched sounds that had become a staple of the genre since the silent era. David Raskin, who had scored the first two Basil Rathbone-starring Sherlock Holmes films in the early thirties, as well as a number of film noirs, was one of the pioneers of these sounds. Yet horror overused these initial innovations and by the 1960s the majority of the genre’s scores were becoming repetitive and stagnant. Perhaps it was time for a new moon? Before examining the films that sparked the rebellion it is vital to establish what traditions of the past the new breed of horror score was evolving from, and so a minor detour into the annals of horror film history is essential. The initial forays into the horror movie score after the sound revolution of 1927 are a perfect lead in to the way that horror films would be scored for the next thirty years. Two films are often discussed as being born out of the sound-era beginnings of the genre, and which defined and benchmarked the visual criteria of horror for years, yet their aural experiments are limited to sourced material rather than originally composed pieces. In Tod Browning’s 1931 film adaptation of Dracula, the first horror picture with spoken dialogue, there is very little in the way of musical accompaniment. The use of Tchaikovsky’s Swan Lake in the opening segment seems to blend well with the eerie visuals and gothic sensibilities and proved so effective that a year later it was used again for the opening to Murders in the Rue Morgue (1932). Other than a brief nod to Schubert’s Symphony Number 8 and Wagner’s Die Meitetsinger Von Nurnberg, the film is largely unscored, predominately concerned with the exciting new addition of audible dialogue. Steve Hill wrote that “the lack of music contributes to the thickly menacing atmosphere… and sometimes, unfortunately, to the boredom of the audience”, summing up perfectly why Dracula isn’t at the heart of the horror film score’s beginnings in the post-silent era. It was a stepping stone rather than a monolith. 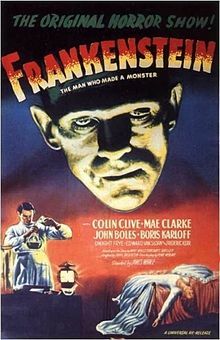 1931’s other benchmark horror picture, James Whale’s superior Frankenstein, also relies on sourced music. It is here where we find the first example of a fully composed piece of music for a talking horror film. Within Bernhard Kaun’s piece we find many of the future techniques composers would implement to supplement the horror on screen, as well music that examines the pathos of the occasional atypical horror situation (specifically monsters who are not evil, only misunderstood). It’s a telling moment that as soon as Kaun’s score ends, the film introduces it’s world to the viewer by the ominous sounds of church bells at a funeral; a sound that would come to typify many scenarios and situations in the gothic cinema. Universal went on to create a cycle of horror films in the thirties and forties and in the process provided many of the genre’s famous fiends and monsters. Their 1932 offering The Mummy included the first composed horror score. Directed by Dracula cinematographer Karl Freund, The Mummy also opened with Tchaikovsky’s Swan Lake. The score then unfolds with a dramatic use of brass creating a strong, masculine leitmotif for Boris Karloff’s Im-Ho-Tep, and an effective use of strings with repeated legato lines providing a quite suitably “spine-chilling” effect. Though not often discussed within the same pool of influence as Dracula and Frankenstein, The Mummy is, aurally at least, as influential in the Universal horror canon as either. James Whale’s Bride of Frankenstein (1935)opens with its own bombastic, flamboyant score but it’s what lies within the coffin of this seminal film that is of interest to the soundtrack scholar. As the first real horror score of this new sound era that is an entirely original composition it can be seen as the best example of it’s kind with terrifying brass, repeated legato strings and descending harp trills. Franz Waxman, who later went onto work on a handful of Alfred Hitchcock films (Rear Window, Rebecca, Suspicion etc) and Sunset Boulevard, could be considered to have defined the blueprint for Hollywood scares that would continue for the next fifteen years. “Waxman used whole tone scales rather than traditional diatonic scales for most of the music, setting a popular stylistic trend for the future horror film music”, said Steven Hill. Cementing his style within the genre by composing the music for the 1941 remake of Dr Jekyll and Mr Hyde, his instrumentation, use of brass as a leitmotif for monsters and use of strings as a leitmotif for jeopardy, became the norm and most horror films, including products of rival companies such as Warner and MGM, were scored in quite similar ways. Other Universal horrors of note were scored by Waxman’s orchestrator Clifford Vaughan, further solidifying the Waxman ideals into the genre through scores to films such as The Black Cat (1934) and The Raven (1935). A further development that also became an integral part of the traditional horror developed through RKO Studios. After the initial flop of Citizen Kane (1941), RKO sort to claw some money back with a cycle of cheap horror films often accredited to producer Val Lewton. It was a result of this lack of budgegt that a new technique in the use of diegetic sound emerged. “The music in Lewton’s cycle of horror films broadly followed the Hollywood norm of the time. Superficially at least, it was similar to the music in the Universal horror films, although, like the films themselves, it was more subtle and measured”, Kevin Donnelly states in The Spectre of Sound, summing up the miniscule change. Though Roy Webb’s score for Cat People (1942) is highly adventurous in itself, the main element borrowed by future sound engineers would be the now-famous “Lewton Bus” effect. The score itself delves into some extremely modern territory and fractionally extends the genre’s principles introduced by Waxman. However, the “Lewton Bus” effect (so named after the famous bus stop scene) will forever be it’s legacy, and it’s use of diegetic sound as a sudden jolt effect after a quiet but tense build up would be something that would transcend the horror genre and become a staple of film sound in general. “Scaring the audiences without the use of monsters”, Hill proposed of Lewton’s influence, summing up the effect that the reasonably new style of score had on the unsuspecting public. After years of textually similar scores, largely from Hammer Studios (James Bernard) and the films of Roger Corman (Les Baxter), a tipping point can be seen in the early sixties where different styles of classical score started to creep in. Bernard Herrmann’s score for Psycho (1960) has been thoroughly dissected many times, while music for films such as Night of the Demon (1957) and The Quatermass Experiment (1955) combine the classic Universal aesthetics with Lewton-like uncertainty to produce the last handful of great, ‘classical’ horror film scores before the 1968 rebellion introduced both electronic and pop elements to the horror soundscape.